The Vulcan delta-winged nuclear bomber entered service in 1956, and served with distinction with the Royal Air Force for over 25 years. A huge triumph for British aviation, the Vulcan fascinated the public and was celebrated in cinema newsreels and news reports. 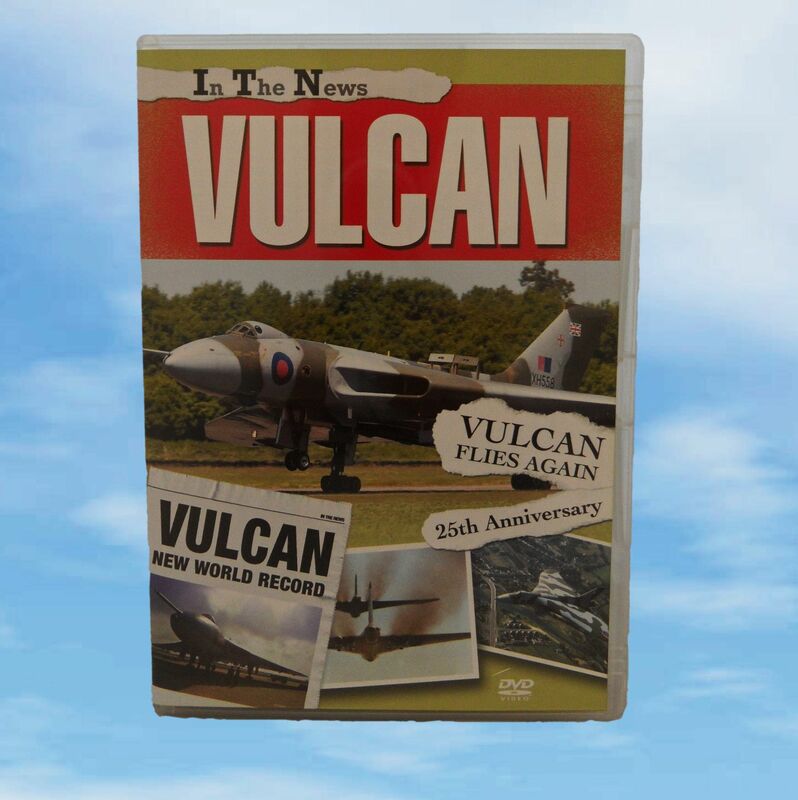 In The News - VULCAN gathers together - for the first time - these precious newsreels and TV reports on one DVD. Many have remained unseen for decades. 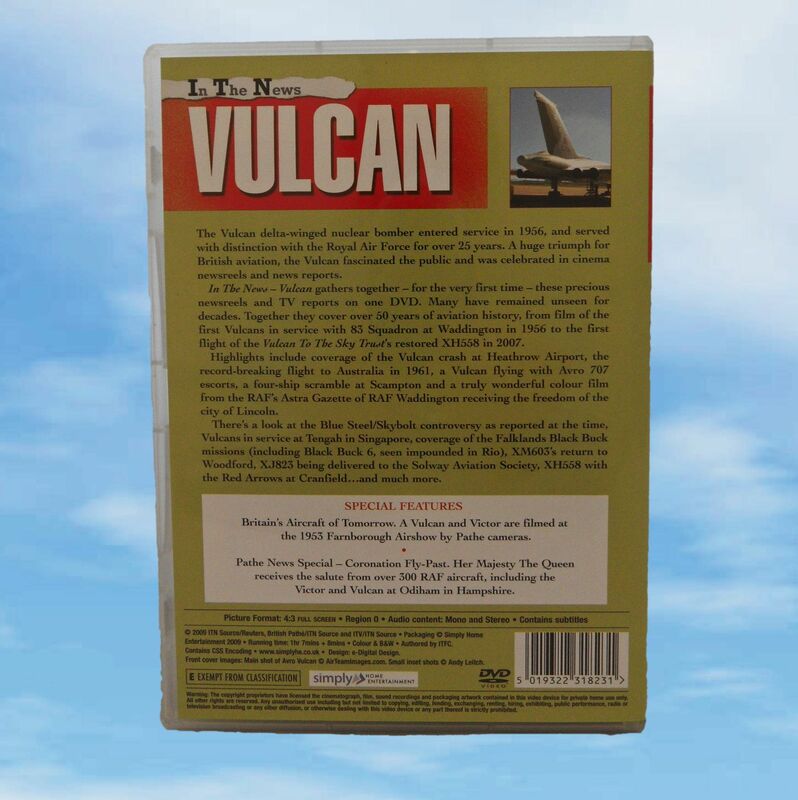 Together they cover over 50 years of aviation history, from film of the first Vulcans in service with 83 squadron at Waddington in 1956 to the first flight of the Vulcan to the Sky Trust's restored XH558 in 2007. Coverage includes the Vulcan crash at Heathrow Airport, the record breaking flight to Australia in 1961, a Vulcan flying with Avro 707 escorts, a four-ship scramble at Scampton and truly wonderful colour film from RAF's Astra Gazzette of RAF Waddington receiving the freedom of the city of Lincoln. There's a look at the Blue Steel/Skybolt controversy as reported at the time, Vulcans in service at Tengah in Singapore, coverage of the Falklands Black Buck missions (including Black Buck 6, seen impounded in Rio), XM603's return to Woodford, XJ823 being delivered to the Solway Aviation Society, XH558 with the Red Arrows at Cranfield... and much more. Britain's Aircraft of Tomorrow: A Vulcan and Victor are filmed at the 1953 Farnborough Airshow by Pathe cameras. Pathe News Special - Coronation Fly-Past: Her Majesty The Queen receives the salute from over 300 RAF aircraft, including the Victor and Vulcan at Odiham in Hampshire.